The demo you just watched in my ani-GIF is based on creating and handling a notification using new iOS 12 functionality and is meant to simulate a real world scenario. Suppose you have a checking account at a bank that offers an iOS app for managing your money and transactions. You’ve got the app on your iPhone. Suppose further that your bank offers overdraft protection for $2.00/month, but you’ve opted out because you’re usually good at keeping your checking account balanced. Because this bank is smart, even if you’ve opted out of overdraft protection, the bank will send you a notification offering to cover your overdraft for a one-time $25.00 fee. They’ll cover your overdraft if you consent in their new iOS 12 interactive notification. Sometimes paying an overdraft fee is preferable to a scar on your credit report, and preferable to paying all the other fees that all parties may charge you in the event of a non-payment. Remember this is a prototype and not a real banking app. I’ve included a sample Xcode 10 project, written in Swift, so you can follow along with my code during this tutorial. You can download it from GitHub. Editor’s note: To build and run the project properly, please edit the bundle identifier and change it to your own identifier. The new iOS 12 notification feature I’m describing in this tutorial is not to be confused with previous operating system versions’ features that allowed you to, for example, tack predefined “Accept” and “Decline” buttons onto the bottom of notifications. An example of this type of behavior is shown and described in an Apple developer documentation article entitled “Declaring Your Actionable Notification Types”. Please note that since the public beta software has not yet been commercially released by Apple, it may contain errors or inaccuracies and may not function as well as commercially released software. Documentation provided by Apple may contain preliminary information about a beta version of an API or technology in development. This information is subject to change, and your software implemented according to this documentation should be tested with final operating system software. For the most up-to-date information, be sure to read the release notes for the version of software that you are using. 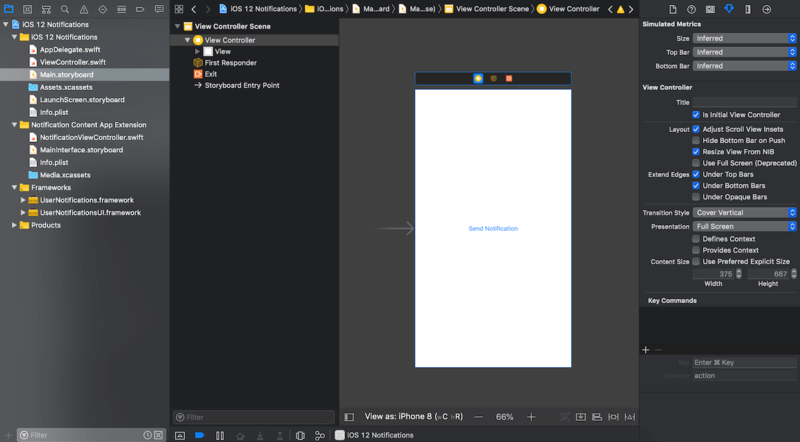 To follow along with my tutorial, create a new Xcode 10 project based on the iOS Single View App template. 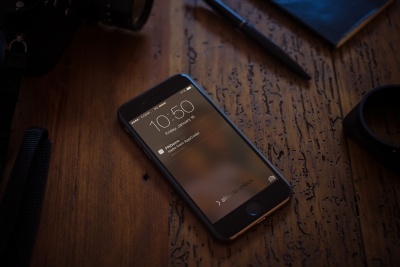 As an iOS developer, you should be familiar with local and remote (push) notifications by now. While I will cover the basic setup for sending notifications, I’ll assume you can follow along without a large amount of detailed guidance on my part. Obviously, I have to send a local or remote notification before I can receive one. To save time and help you to concentrate of customizing notifications instead of getting lost in the intricacies of push notifications, I’m going to stick to local notifications. Notifications and any custom UI and interactive features will be the same regardless of whether a notification was sent locally or remotely. Nevertheless, I will highlight a few important steps required when sending remote notifications. Keep in mind that the app I’m building here is named “iOS 12 Notifications.” You’ll see the app name in several images, so keep that name in mind. // Request user's permission to send notifications. iOS requires that we define strings to differentiate between different types of notifications that our apps can send and receive. 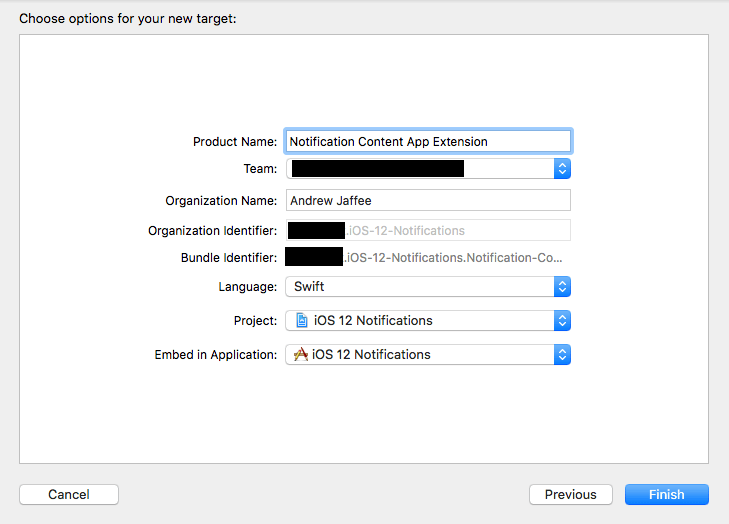 This allows us to recognize and prepare for supporting notifications with different UIs, styles, actions, etc. The Apple documentation on the new iOS 12 notification custom UI feature is quite explicit about this step. To define a “notification’s category value–its type,” for this tutorial, I added the following code to my sample app’s ViewController.swift file in the viewDidLoad() method. Note that there are two lines of code, with corresponding numbered comments, that I will explain below in detail. // #1.1 - Create "the notification's category value--its type." // #1.2 - Register the notification type. #1.1 – I’m creating an instance of the UNNotificationCategory class using the init(identifier:actions:intentIdentifiers:options:) initializer. Since my notification will have a custom interface, all’s I care about here is the identifier instance property. I leave the remaining parameters empty. Note that Apple says “You may specify nil for this parameter if you do not want to display custom actions” regarding the actions argument, but the beta compiler will only accept an empty () array. As stated earlier, I’m not going into enormous detail on the topic of creating and sending a notification. My code is very readable, well-commented, and you can always read up on an overview of the process at links like this one or more specifically at this link. Editor’s note: You can also refer to this introductory tutorial about the User Notification framework. // previously registered with your app." content.title = "DEBIT OVERDRAFT NOTICE!" content.subtitle = "Exceeded balance by $300.00." content.body = "One-time overdraft fee is $25. Should we cover transaction?" // includes the content of the notification and the trigger conditions for delivery"
// trigger condition is met, the system delivers your notification." As you’ll see below, we want to route this notification through an app extension that I’ll write below. "title" : "DEBIT OVERDRAFT NOTICE!" "body" : "One-time overdraft fee is $25. Should we cover transaction?" Notice that I have to tap, hold, and pull down on the notification to expose this new iOS 12 notification feature. (I assume you’ll have to test your notifications in iOS 12 to find out if they have extended UIs.) The blue “info” (i) image and blue “Cover” button are what I added as my custom notification interface. 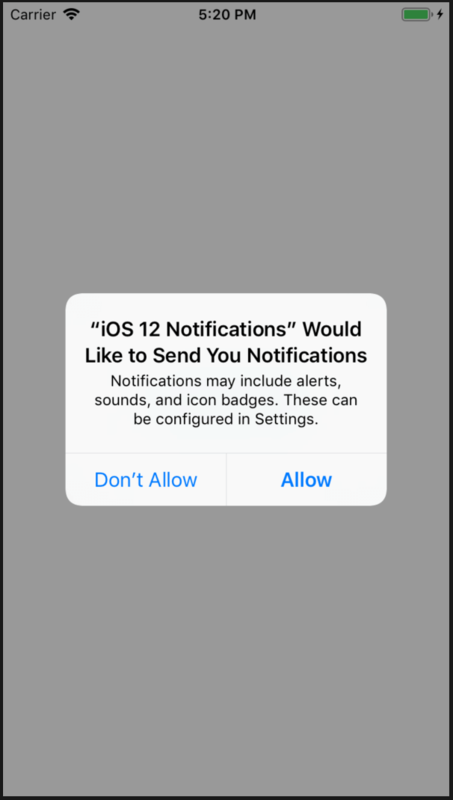 When an iOS device receives a notification containing an alert, the system displays the contents of the alert in two stages. Initially, it displays an abbreviated banner with the title, subtitle, and two to four lines of body text from the notification. If the user presses the abbreviated banner, iOS displays the full notification interface, including any notification-related actions. The system provides the interface for the abbreviated banner, but you can customize the full interface using a notification content app extension. 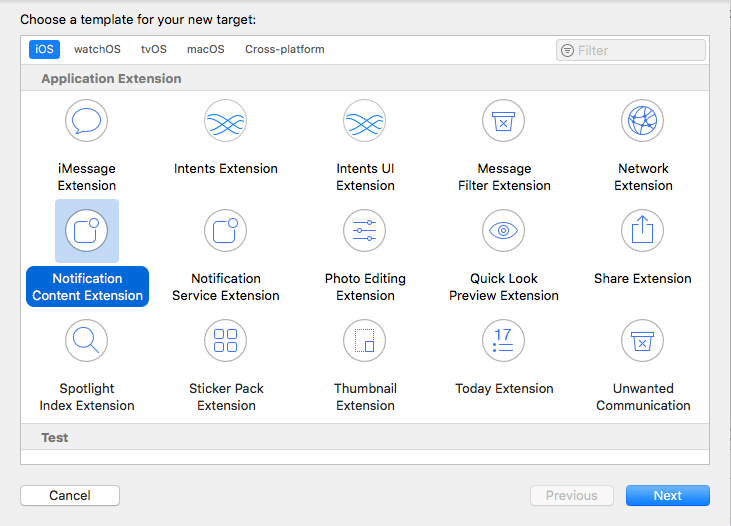 Notice the last sentence in my previous quote from Apple: “you can customize the full interface using a notification content app extension.” So we’ll add a “notification content app extension” to my sample app’s Xcode 10 project. This extension adds a UIViewController subclass which adopts the UNNotificationContentExtension protocol. • Customize the placement of items, including the alert’s title, subtitle, and body text. • Substitute different fonts or styling for interface elements. • Display app–specific data–for example, data stored in app-specific keys of the notification’s payload. • Include custom images or branding. 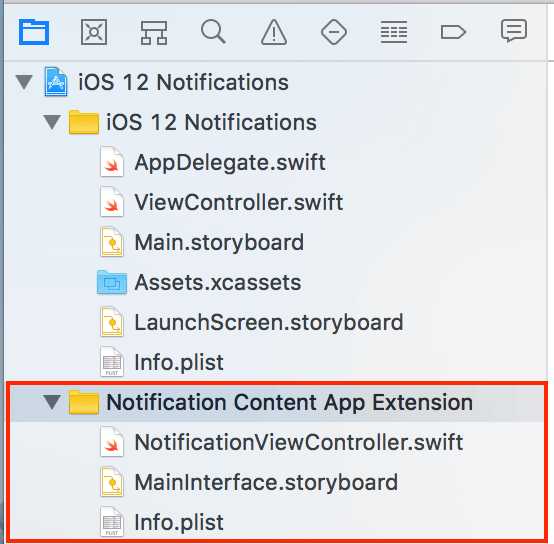 Your app extension must configure its view controller using the data immediately available, such as the contents of the notification and the files present in your app extension’s bundle. If you use an app group to share data between your app and your app extension, you may also use any files found in the app group. To ensure your notifications are delivered in a timely manner, configure the views as quickly as possible. Don’t perform any long-running tasks, like trying to retrieve data over the network. The default code and storyboard provided by your new extension can point you in the right direction for getting started with in-notification custom UIs. Open the extension’s Info.plist file and review the NSExtension dictionary. Do you remember how I assigned the string “debitOverdraftNotification” as the identifier property of a UNNotificationCategory object and registered it with the UNUserNotificationCenter? Setting the UNNotificationExtensionCategory key to “debitOverdraftNotification” is the key step in getting this extension to intercept notifications sent by my app and giving this notification a custom UI. Notice that green rectangle in the notification UI contains the string I assigned to the body property of the UNMutableNotificationContent object that I created and sent as part of a notification in my sample app’s ViewController.swift file. My string, “One-time overdraft fee is $25. Should we cover transaction?,” is displayed in a UILabel hosted by a UIViewController subclass, NotificationViewController. Speaking in terms of MVC, the UILabel is the view in MainInterface.storyboard, and NotificationViewController is the controller in the extension’s NotificationViewController.swift file. Since the NotificationViewController class adopts the UNNotificationContentExtension protocol, it must implement the didReceive(_:) instance method. This is where the notification payload is accessed and my body string from the message I sent from my app can be now displayed inside the notification, as we just saw above in my ani-GIF. Notice that the UNNotificationContentExtension protocol uses the same nomenclature, e.g., didReceive(_:), as does the UNUserNotificationCenterDelegate with its userNotificationCenter(_:didReceive:withCompletionHandler:) method. 1) UNNotificationExtensionCategory (Required): We covered this ad infinitum already. Again, remember that I assigned the string “debitOverdraftNotification” as the identifier property of a UNNotificationCategory object and registered it with the UNUserNotificationCenter. I did so because, if UNNotificationExtensionInitialContentSizeRatio is set to 1, iOS 12 initially creates a very tall notification and then quickly self-corrects the notification’s height, making it shorter, to reflect my extension view controller’s intrinsic content size. You’ll see this mainly the first time the app/extension are run. Be careful when changing the extension view controller’s height. Be especially careful when changing its width! 4) UNNotificationExtensionUserInteractionEnabled: If you want your custom interface to respond to user gestures, you better set this to true. Do not do anything like adding gesture recognizers to your extension’s view controller. You’ll get crazy results. There’s a UIImageView whose @1x, @2x, and @3x source images are stored in a Media.xcassets folder that I added to the extension. I’ve control-clicked to show you that the UIButton named “Cover” has an @IBAction to the method coverButtonTapped(_:) in file NotificationViewController.swift. There are several @IBOutlet variables that I use for animation. I leave it to you to study my sample app’s storyboard. By now, you should have a good idea of what I’m doing in my custom UI for my notification. Still, I’m going to describe my code in a series of steps — steps that are also comments in my code shown below. I’ll show you my code first, then describe the steps/comments. @IBOutlet weak var clearedTransactionLabel: UILabel! @IBOutlet weak var coverButton: UIButton! // #3.6 - called when the user clicks "Cover"
// fade in the "Your overdraft was covered!" #3.1 – You should know by now why I need to import these frameworks. #3.2 – Since the NotificationViewController class adopts the UNNotificationContentExtension protocol, it must implement the didReceive(_:) instance method. This view controller would be useless without adopting the UNNotificationContentExtension protocol. #3.3 – These outlets allow me to animate (fade in/fade out) several buttons, giving users a pleasurable experience. #3.4 – I hide the “Your overdraft was covered!” label initially. It only makes sense to show it if the “Cover” button is tapped. #3.5 – didReceive(_:) is only called when a notification is intercepted by this extension. (Why? Because this extension’s Info.plist registers for the “debitOverdraftNotification” notification category type.) This method is a good place to do things like decrypt the bank account or transaction numbers from the payload. It also presents us with a good opportunity for parsing any other important information, like the overdraft dollar amount to cover, out of the payload. #3.6 – This @IBAction is called when the user clicks the “Cover” button in my custom notification UI. While there a multitude of ways we could process a financial transaction, secure REST APIs are popular and well-supported nowadays. We could build a payload, probably encrypted, to call our REST API, sending the transaction to cover the overdraft. #3.7 – When the user taps the “Cover” button, I fade it out and simultaneously fade in the “Your overdraft was covered!” message. People are always looking for better ways to save time by staying connected and accomplishing tasks more efficiently and conveniently. Apple technology for notifications has marched forward and iOS 12 has made some important improvements towards these ends. Getting notified about important events and being able to responding immediately inside a notification, with a custom UI, is definitely a step forward for iOS. A custom UI supporting many of Apple’s controls is definitely an improvement over notifications that are constrained to only having buttons tacked onto the bottom of the notifications. My banking use case and prototype app highlights iOS 12’s new features for allowing users to respond to events in real time. Several other examples come to to mind. Imagine that several unusually large purchases were made on one of your credit cards. Your credit provider could send you a notification with several buttons: one to have a customer service representative call you immediately, one to freeze your account, and one to show you details about the unusual transactions. Imagine that you need to keep some kind of facility’s temperature within a certain range. You could have sensors hooked up to a workstation. The workstation could generate push notifications that contain a slider with which you could adjust the facility’s temperature in real time. The sky’s the limit. With iOS 12’s new notification features, you can make major improvements to your apps.